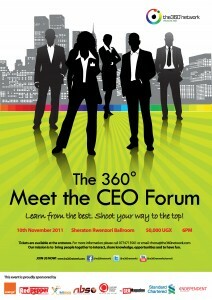 Do you know what the 360° Meet the CEO Forum is all about and why you should not miss it? David Lambert Tumwesigye spoke to The Independent about Meet the CEO Forum. Below is the Q&A explaining the idea, its objectives and how it helps you achieve your personal development objectives. The 360° Network’s was launched on 7 August 2009 with a mission to bring virtual and real people networks together to interact, share knowledge and opportunities and to have fun. The 360° network idea was inspired by the increasing use of social media particularly Facebook, in Uganda. And we thought that rather than use Social Media for sharing only the fun stuff, we would use it to mobilise people to enhance their lifer style and build their business networks. So, the 360° Network is designed to leverage the powerful networking and communication synergies provided by these Social Media like Facebook, Twitter and YouTube for the benefit of their membership and business entities alike. Our goal is to transform online social networks into a real people-2-people experiences by building a life changing network for members to interact with each other and share information, knowledge, skills, and opportunities, thereby improve their lifestyles. We organise regular events for learning, networking and recreation. We hold these meetings so that our members get to meet one another. However these meetings are not limited to socialising. We make sure we have guest speakers from various parts of society. These are business persons, investors, high profile media persons, and people from various fields. These speak on topics such and any like Personal Finance, Entrepreneurship, Leadership, Personal Development, Networking, Personal Branding and Professional Development, Family, Lifestyle, Spirituality and any other issues we feel are important to our members. In brief, we aim at creating and providing knowledge in a fun manner and environment. Membership is free and open to like-minded corporate and business executives in Uganda. 2. What influence has the Network had so far on the community? Since 2009, over 2500 members have joined the network and participated in 360° Forums and Cocktails to discuss and share knowledge. We hold these meetings so that our members get to meet one another and learn. However these meetings are not limited to socialising. We make sure we have reputable guest speakers from various parts of society. These are business persons, investors, high profile media persons, and people from various fields. These speak on topics like Personal Finance, Entrepreneurship, Leadership, Personal Development, Networking, Personal Branding and Professional Development and any other issues we feel are important to our members. In brief, we aim at creating and providing knowledge in a fun manner and environment. In June 2011, we hosted Uganda’s top Entrepreneurs to share the fundamentals of business success and most recently, we held our 3rd Oldskool Reunion which is a unique annual recreation and networking event. With the support of the US Mission in Uganda, we shall open 360° Campus- a network that will help university students to make a seamless transition into the workplace. 3. What is idea behind the 360° Meet the CEO Forum? Meet the CEO Forum is an annual event that brings Uganda’s top CEOs in touch with the people they inspire to share their knowledge and experience. It is in line with our mission to help members learn and network. The objective of this forum is to help participants appreciate the path to personal and business excellence. It is an opportunity to learn from the best, to network and share knowledge and opportunities with peers in the corporate world. Guests have an opportunity to interact and meet the CEOs one-on-one in a relaxed environment. 4. How would one assess the previous events you have organised? Very successful! We have been overwhelmed by the response that this idea has generated both online and offline. The feedback we get indicates that we are helping people meet their personal development goals. Most people believe that holding 360° Forums and Cocktails in the evening is an innovative way that ensures that members can acquire new knowledge, build their business networks and have fun, within their busy schedule. We believe that several persons have brilliant ideas, which with the right amount of networking, publicity and positive encouragement can be transformed into fruitful ventures. 5. Why is it important to bring Uganda’s top CEOs in touch with young and upcoming leaders? Excellence is not a gift. It is a habit that must be developed if one is to succeed in their career or business. Meeting the CEOs is a work n’ play workshop where you can learn the 5 keys to personal excellence. These men and women have, against all odds, made their way from the bottom rungs of the corporate ladder to the top. While you can learn about this journey in any personal development book, we believe that reading a book about how to make it to the top is an entirely different experience from meeting the person whose life is profiled in the book. Meeting the CEO puts a face to this incredible story and is great inspiration to anyone who is keen to excel at whatever they do. 6. What was the criteria for selecting the participating CEOs? The CEOs are nominated by members online. We look out for leaders with outstanding personal character, notable business achievements as well as the impact they and their businesses have on the community within which they operate. 7. What are the target audience ? Meet the CEO forum is an even for corporate and business executives that are keen on enhancing their career and business prospects through new knowledge, networking and inspiration. Depending on their motivation, even a starting level professional should attend although the key target for this event is the mid to senior-career professional and business executive that is preparing or has already joined the fast lane to C-suite. 8. What does one have to do to participate in the Forum? 9. What format will the forum take? The event will start with a cocktail at 6 pm. An interactive and moderated discussion/debate with Mr. Lamin Manjang (CEO Standard Chartered Bank), Dr. Ian Clarke (CEO, International Medical Group) will be moderated by Mr. Caleb Owino, MD fireworks Advertising. Other panellists pending confirmation include Ms. Allen Kagina (Commissioner General, URA) and Ms. Florence Kata (Executive Director, Uganda Export Promotions Board). 10. What benefits should participants expect to come away with from the Forum? Guests will have an opportunity learn from, interact with like-minded people and the CEOs one-on-one in a relaxed environment. Corporate businesses that choose to purchase corporate tickets will have exhibition and branding space at the venue.